In February, authorities in Indonesia held an exercise for Sumatran rhino researchers to track and tally the remaining wild population of the species. The government aims to finalize an official count of the critically endangered rhino within three years, according to the environment ministry. Natural breeding for the rhinos has been particularly difficult as the remaining individuals live in fragmented lowland forests away from each other. On top of that, rhinos are slow breeders and the females have a short fertility period. Estimates of the current size of the wild Sumatran rhino population range from 30 to 100 individuals. Another nine live in captivity in Indonesia and Malaysia. “We want definitive clues that point us to where the Sumatran rhinos are,” said Budiono, a member of the Rhino Protection Unit with the Indonesian Rhino Foundation (YABI). Budiono was one of 34 people taking part in the painstaking search for signs of the critically endangered animals in known rhino habitats within this park, one of the species’ last strongholds. The five-day program took place in February, a collaboration between the park agency, Indonesia’s environment ministry, YABI, and the International Union for Conservation of Nature (IUCN). The exercise was part of a bid to obtain more comprehensive information on the size of the rhino population on Sumatra, home to the majority of the surviving members of this nearly extinct species, said Indra Eksploitasia, the environment ministry’s director of biodiversity conservation. Harapan, a male rhino born in the U.S., is cared for at the Sumatran Rhino Sanctuary in Way Kambas National Park. Image by Muhammad Adimaja. Historically, these last remnants of Dicerorhinus, the most primitive rhino genus, have been threatened by habitat loss, climate-induced habitat fragmentation, and poaching. Today, with the remaining wild rhinos fragmented into small, isolated populations, researchers fear more of the animals are dying of natural causes than are being born. The rhino monitoring exercise in Way Kambas, in the province of Lampung, was also designed to prepare participants to conduct independent censuses in other rhino habitats, such as in northern Sumatra’s Aceh province and Borneo’s East Kalimantan province. 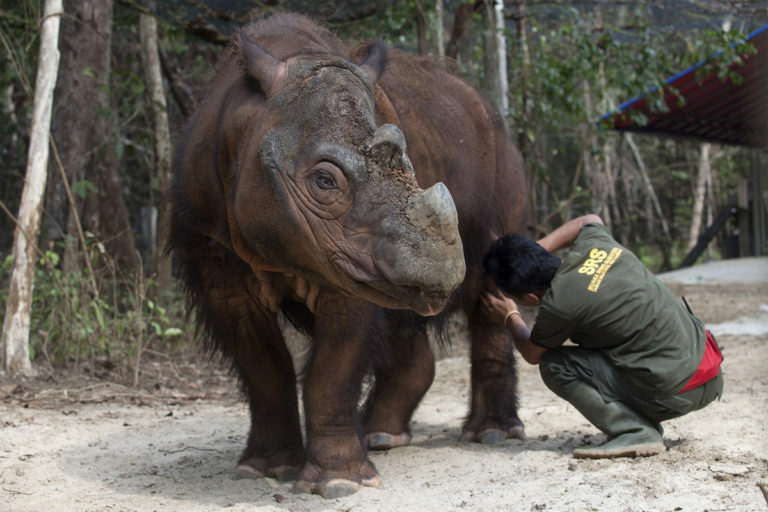 “This is part of the government’s efforts to rescue the Sumatran rhinos,” Indra said. The government aims to finalize an official wild rhino count within three years, according to the environment ministry. To allow the rhinos to properly breed, the government estimates that every subpopulation must hold at least 15 individuals. Populations that are too small to breed will be relocated and combined into larger groups. “The focus right now is to rescue the rhinos,” Indra said. 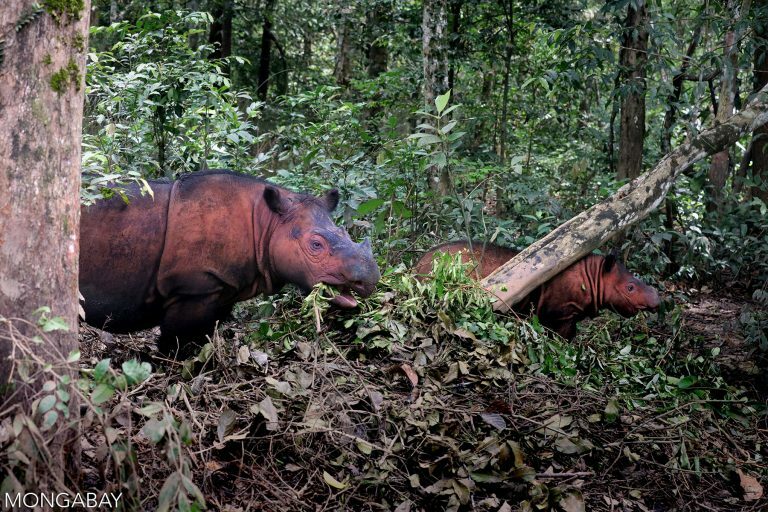 A Sumatran rhino with her calf in Way Kambas, Sumatra, Indonesia. Image by Rhett A. Butler/Mongabay. Natural breeding for the rhinos has been particularly difficult as the remaining individuals live in fragmented lowland forests away from each other. On top of that, rhinos are slow breeders, and the females have a short fertility period. “In some subpopulations, encounters between rhinos are so rare that it’s so difficult for them to mate,” said Widodo Ramono, the executive director of YABI. At the Way Kambas sanctuary, a female rhino known affectionately as Bina has reached an age where her eggs are no longer viable to be collected for in vitro fertilization, Widodo said. Another female, called Rosa, has mated at least four times, without a successful pregnancy. According to Widodo, Rosa did conceive after mating with Andalas, one of the two male rhinos at the sanctuary, but the pregnancy lasted only a month and caused her to suffer from a uterine tumor. But it isn’t all gloom and doom for the Sumatran rhinos in Way Kambas National Park, said Subakir, the head of the park agency. He said his team recently found what they believe to be the footprints of a female rhino and her calf — signs that at least some of the park’s rhinos are successfully breeding. “[The discovery] was about three months ago when our team was patrolling,” Subakir said. For the park, that’s enough reason to beef up protection from the dangers of poaching, encroachment and deforestation, he said. “I hope that Way Kambas can be the poster child for good conservation in Lampung,” Subakir said. Read Mongabay’s history of the Sumatran rhino breeding program, from 1984 to the present, here. 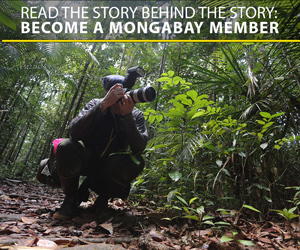 Banner image is of a female rhino in Way Kambas National Park courtesy of the Sumatran Rhino Sanctuary. This article was first published on our Indonesian site on Feb. 27, 2019.